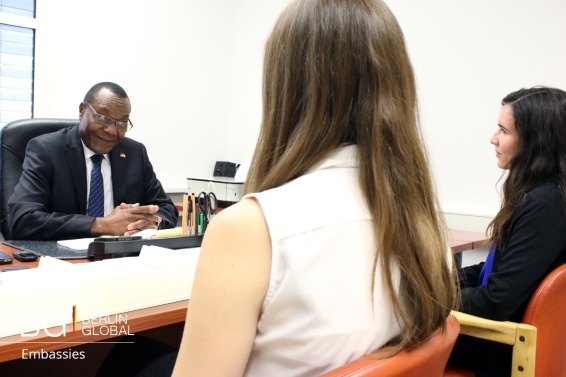 On 23rd August 2016, the ICD had the honour of interviewing His Excellency Ambassador Marcel R. Tibaleka, the Ambassador of the Republic of Uganda to the Federal Republic of Germany, at the Embassy of Uganda in Berlin. During the interview, the Ambassador spoke about his experiences with cultural diplomacy, the relationship between Uganda and Germany and the focus of his ambassadorial work. His Excellency Marcel R. Tibaleka has been Ambassador to Germany since 2012. Yet the path he took to get to this position is particularly interesting as his career did not begin as a diplomat, but rather started out in the Ugandan police force. It was only following his retirement from the police that he was appointed to his first ambassadorship by President Museveni of Uganda. Ambassador Tibaleka believes his extensive experience in the police force has been of much assistance in his work as an Ambassador, as it taught him to, “adapt to different challenges and situations on a daily basis” and often required diplomacy in communication. He believes that his, “involvement in cultural and political activities”, together with his career in the police force, has, “shaped [his] destiny to become Ambassador”. His Excellency then went on to discuss his view of cultural diplomacy and the cultural ties between Uganda and Germany. “To me, cultural diplomacy is of utmost importance”, Ambassador Tibaleka told us. “In times of intense globalisation and readily available access to mass media… cultural diplomacy is essential in the promotion of stability, peace and socio-cultural interaction”. Uganda is a nation with 54 ethnicities, each of which has its own dialect. The Ambassador explained how each ethnicity is able to recognise one another and acknowledge their differences whilst also respecting each other. His Excellency sees cultural diplomacy as being of integral importance for the protection of international human rights, as well as local peace and stability: “I believe that cultural diplomacy is an integral part of economic, political and commercial diplomacy that should be applied to achieve a common goal”. We then went on to discuss the focus of H.E. Marcel R. Tibaleka’s ambassadorial work. The focus of his work is threefold. Firstly, he aims to increase Ugandan visibility in Germany and encourage Germans to travel to Uganda. Secondly, his work is focussed on promoting foreign investment in Uganda by encouraging trade between both countries, particularly in the fields of economic and commercial diplomacy: “Uganda is a land with enormous business opportunities. Both countries’ institutions are actively seeking to promote bilateral economic relations”. Thirdly, His Excellency’s role also involves supporting the Ugandan diaspora, both in Berlin and across Germany. On a recent visit to Munich, the Ambassador was impressed to see that over 200 Ugandans attended one of the consulate’s functions. The Embassy is also actively involved with the Ugandan community in Berlin and encourages Ugandans to register to stay in contact with the Embassy and with their homeland. The Ambassador then shared with us his experiences of successful inter-cultural dialogue across his career. “One of the most recent highlights was a chairmanship at this year’s Annual Commonwealth Dialogue, which was hosted by the British Chamber of Commerce”. Here, His Excellency addressed Ambassadors and business representatives, working towards the goal of “offering a forum for people from different nations and professional backgrounds to network and exchange ideas”. This was an “excellent opportunity to put cultural diplomacy to the test”. Further to this, the Ambassador told us about the ‘Uganda Congress’, which took place in February 2016 and which was organised and hosted by the Honorary Consul in Leipzig, together with Leipzig Zoo. He was very proud to attend this event, which “opened the world Uganda’s wildlife to German visitors”, and also paved the way for the signing of a Memorandum of Understanding between Leipzig Zoo and the Ugandan Wildlife Authority. The Embassy is proud to participate in events which “focus on the strength, potential and beauty of Uganda”, such as the ITB Berlin, the ‘world’s leading travel trade show’, where it regularly ranks amongst the top 10 exhibitors. The Ambassador described this as “cultural diplomacy at grass roots level” and emphasised the positive feedback he receives from visitors of such events. We then spoke about the long history of cooperation between Germany and Uganda, which began in 1964 following the Ugandan independence of 1962. Ambassador Tibaleka told us that cooperation between Germany and Uganda in the development sector is particularly strong. There are a large number of German companies, development workers and NGOs working in Uganda to utilise the many natural resources, such as fertile soils, sizeable mineral deposits of copper and cobalt, and untapped oil and gas. His Excellency shared with us his concern about the unequal access to clean and safe drinking water in Uganda, particularly in rural areas, and explained that “despite wealth in natural resources, political stability, and economic growth, the country is still facing numerous challenges, predominantly in the fields of renewable energies, sustainable economic development and water and sanitation… although a lot has happened in these areas, at times progress is very slow”. Cultural diplomacy is also facilitating economic cooperation between Germany and Uganda, such as in the German-African Business Day. 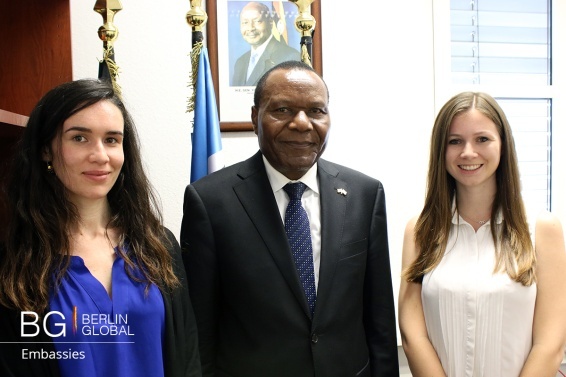 “Commercial diplomacy doesn’t happen without cultural diplomacy”: the Ambassador told us about the business relationship between Germany and Uganda, which was strengthened by the recent German-African Business Day. President Museveni visited Berlin to attend this event, which was focussed on improving collaboration between both countries, and met with senior members of the German government and industrial leaders of German business sectors there. This was followed up by the visit of a German business delegation to Uganda in August, where memoranda for future business and investments were prepared. “The success of German companies in Uganda is based on the economic and cultural bridges that exist between both countries… mutual respect, as well as political, economic and cultural initiatives, are also contributing to the success of German businesses in Uganda” the Ambassador added. He hopes that funds acquired for an ongoing hydro-project will attract investment to his region. Finally, His Excellency had some advice for aspiring diplomats. “Learn foreign languages… they create cultural bridges between people from different nations”. Languages are a “strategic tool to expand diplomatic relations” and provide the foundation for the building of a modern world without language barriers. The Ambassador also advised those wishing to enter the field of international diplomacy to keep up with current affairs around the world, to listen well, to analyse and to problem-solve, and to learn how to apply these skills to foreign cultures. His Excellency added that, “promoting international trade requires one to learn about a country’s economy, business practice and banking system”. Furthermore, he advises the next generation of diplomats to learn the etiquette and customs of host countries, to be tactful, polite and patient, and, most importantly, to “present your country with the grace and dignity befitting a diplomat”. We would like to thank His Excellency Marcel R. Tibaleka for his time and for his fascinating insights into the world of Ugandan diplomacy. We would also like to thank the Embassy of Uganda in Berlin for their cooperation.